Daniel's dad is taking Daniel to Leisure World Holiday Complex for some time away together. Daniel hates exercise and is overweight, so he isn't happy with this choice. His father wants them to get healthy, which means he tries to force Daniel to spend time doing what he hates the most, sport. Daniel is struggling in many different ways. His father is depressed and he's drinking too much, so it's Daniel's task to look after him. The holiday is a complete disaster and Daniel has an entire week to get through. The holiday complex doesn't have a nice atmosphere and most people aren't friendly. When Daniel meets Lexi he's relieved he's found someone interesting to talk to. Lexi is a good swimmer. She's also really smart and they have a lot in common. However, Lexi is hurt. She's covered in bruises and every time Daniel sees her she's looking worse. What's going on with her, is she hiding a dark secret and is there anything Daniel can do to help her? Daylight Saving is a beautiful gripping story. I was immediately intrigued by Lexi. It's clear there's something going on with her and I was curious to find out what it was. She's on her own in a creepy holiday complex, which is a great basis for a scary book. Daniel is smart and kindhearted. He does everything he can to help the people he loves, which regularly gets him in trouble. He's been through a lot and this nasty holiday with his father is something he absolutely doesn't need. He's sensitive and knows something isn't right. He's open-minded as well as clever and therefore it was fabulous to see the world through his eyes. Edward Hogan has written a fantastic ghost story. I love a good spooky read and this book definitely falls into that category. I liked the original setting. The holiday park has a negative vibe, it's eery, there's no kindness and it's a terrible place to be. It's perfect for a good thrilling book. Lexi's mysterious circumstances are adding to the unnerving atmosphere, which is something I found completely spellbinding. 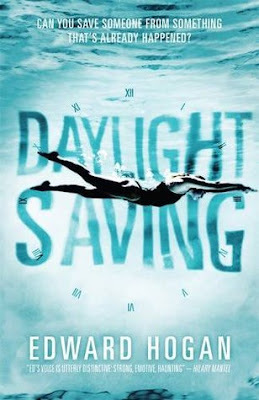 I read Daylight Saving in one sitting, it's a wonderfully strange and captivating story. If you love a good YA ghost story you should definitely read Daylight Saving. Yes, I do. Thanks, it's on my Wish List. Sounds like an emotional story. It sounds like a real page-turner! Love it! I love a god spooky read as well. there is definitely a place for it on my bedside table. I agree. An empty holiday park would be creepy & is a perfect setting. I've definitely been into the "spooky" as of late and this sounds interesting! Have you ever been at a resort when it's closed? At night? Deserted? Very eerie!